I have had the privilege of knowing/knowing of many brothers and sisters who work tirelessly to help the Prisoners and their families. Their dedication is second to none. Their concern is as if their own blood family was in trouble. I have seen you and you are worth far far more then me. We say because they suffer. We say they are everything to us. We say because you never gave them a chance. We say it’s only through this we will be helped. We say anyone with a conscience. We say you are right; the media would never lie. We say whatever we can. Masha'Allah it's very nice, Jazaka'Allahu Khair. 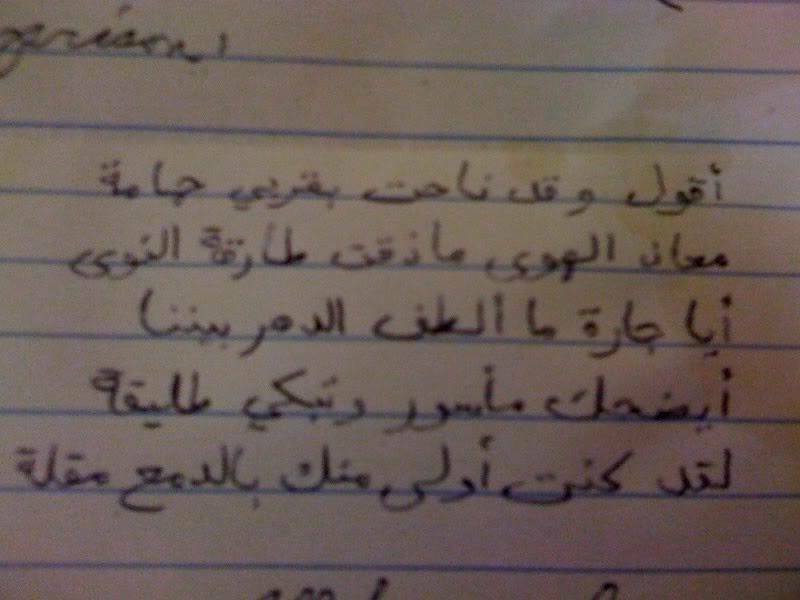 Speaking of prisoners I received a letter from John Walker Lindh (his Muslim name is Yahya), I might post it on voice for justice forum but not sure (I might have to ask him for permission). He wrote me a poem in Fusha, my Arab friends couldn't translated it. I asked someone to work on it but it's taking them long. John walker lindh wrote you a letter? Yeah, and he wrote me a poem in fusha, I can't find anyone who can translate it. All the Arabs I've asked couldn't do it. But one person told me that is was a poem written by a Byzantinian (if that's a word)...something about a Dove... I don't know. Alhamdulilah someone translated the fusha for me however they translated it into Arabic. Should I post it here? Would you guys like to give it a go? Sorry I don't have a scanner so I took a picture. 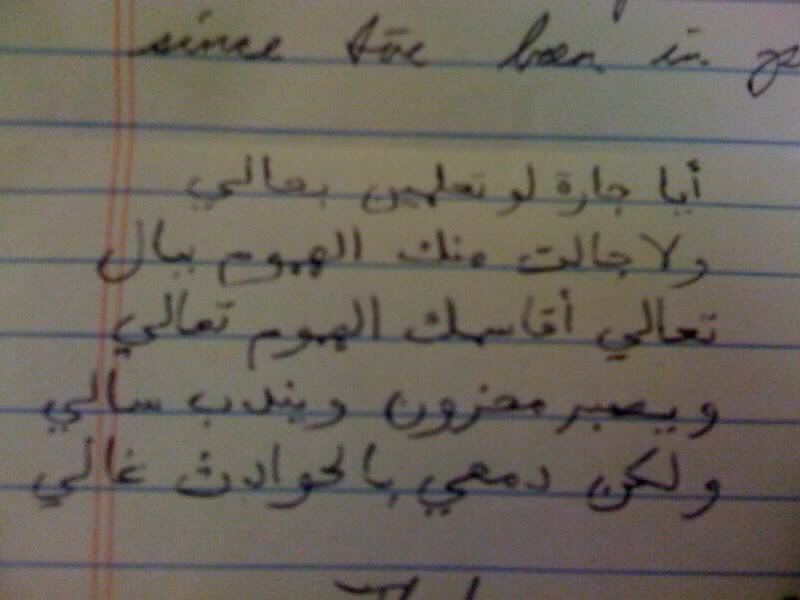 Hope it's readable, insha'Allah you could find someone (or translate it yourself). for the letter, he's got good handwriting, how is he doing these days? It was written by al hamdaani when he was captured after being injured. Do you still have their translation of it? Alhamdulilah a super hero came to save the day (as always), I have my translation now. As far as Brother Yahya he isn't complaining, very patient masha'Allah. Insha'Allah I'll be sending another letter, I'll be writing to sister Aafia soon, hopefully she will get my letter and she too will respond? We should all write to our Muslims prisoners and show them support. Imagine if we were confined to a small cell away from the outside world, a simple letter boasts their spirits and their moral...it reminds them that there is a believer out there thinking of them and making dua'a for them. 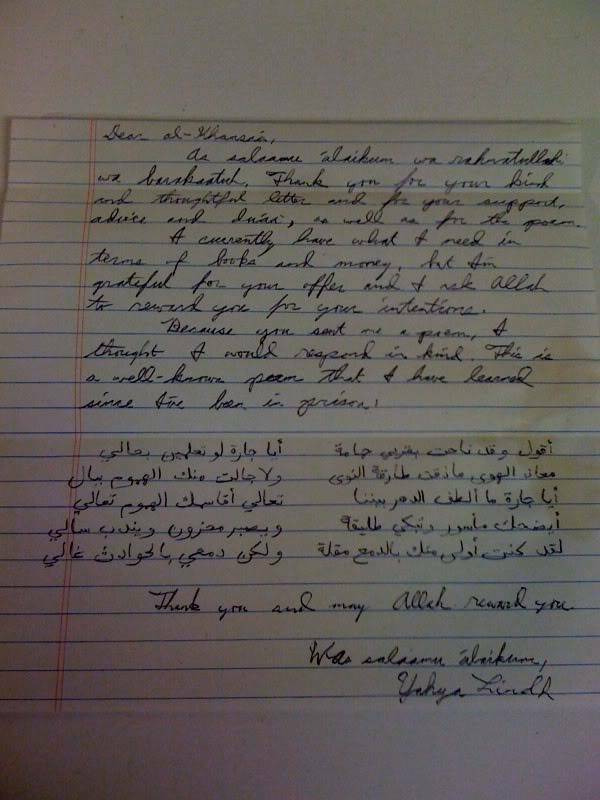 You too can write to brother Yahya or other prisoners, insha'Allah if you'd like I could mail it for you? This goes for any member on the forum insha'Allah. for the offer, i will have to see how letters work around here In-Shaa Allaah.